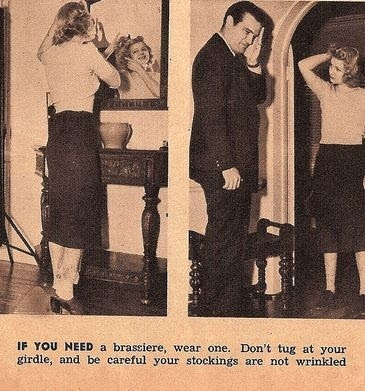 Thanks to BuzzFeed for posting 1930's images with advice to all the single ladies. As we approach 2012, it is a whole different dating game. Your sweet grandmother's days as a single woman are nothing like yours. Game on, girls. Today: Take your time choosing an outfit that makes you feel confident and apply your makeup without looking overdone. If he has to wait a bit, who cares? You are worth the wait. Today: Rock a backless dress sans bra to show off your fit physique. Black opaque tights are a must during the winter, but leave the Spanx at home. If you've got it, flaunt it. 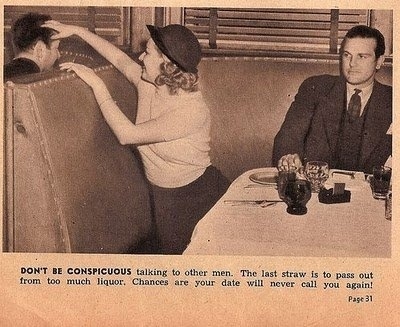 Today: Feel free to be social when on a date. Being friendly to your server, the hostess, and other guests is polite. Don't be rude. 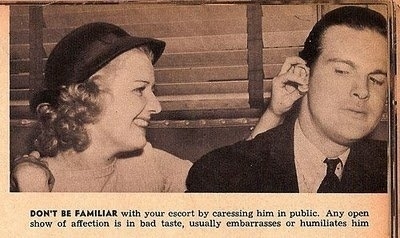 Your date will appreciate your manners and pleasant attitude, while you spend dinner getting to know each other. Today: Topics of conversation should range, including BOTH of your interests. Your handsome date needs to learn about you just as much as you need to learn about him. Today: Feel free to touch his arm or graze his knee when talking and laughing. These intimate touches, while discreet, will show him with your body language that you're attracted to him and enjoying yourself. Today: If he does something to upset you, try not to ball your eyes out for all to see, but don't hide your emotions completely. If he is rude, insensitive, or an all-around jerk, voice your opinion, girl! 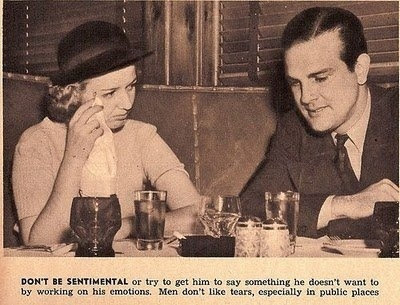 And if a guy you're dating dumps you in public, you have every right to cry and shout. Today: Enjoy a couple glasses of wine, champagne cocktails, or a beer or two. Don't get wasted, but feeling tipsy is okay on a date to relax your nerves. 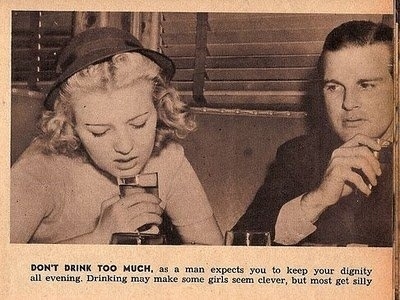 You know how to handle your booze. 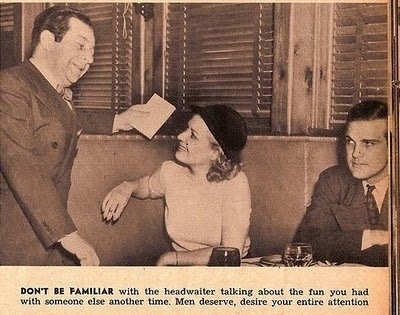 Today: Feel free to speak to other men if they start up a conversation by the bar or in the bathroom line. You can talk to whomever you please as long as you don't leave your date by exiting with the new guy. No man can tell you who you can and can't talk to. You are your own woman. 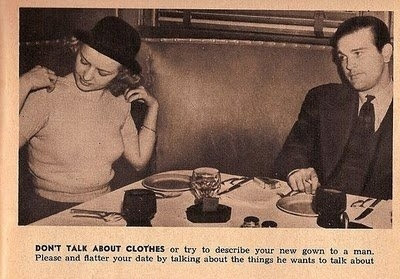 OMG I find the advice in the 30s horrifying haha glad I live in 2011! I too agree with the here and now rules. 2011 rules!